I hope you all had a great weekend! Here a few scenes from our St. Patrick’s Day meal yesterday. The good news is you don’t have to wait until next year to put any of these ideas to use – you can tweak them to work for any meal. 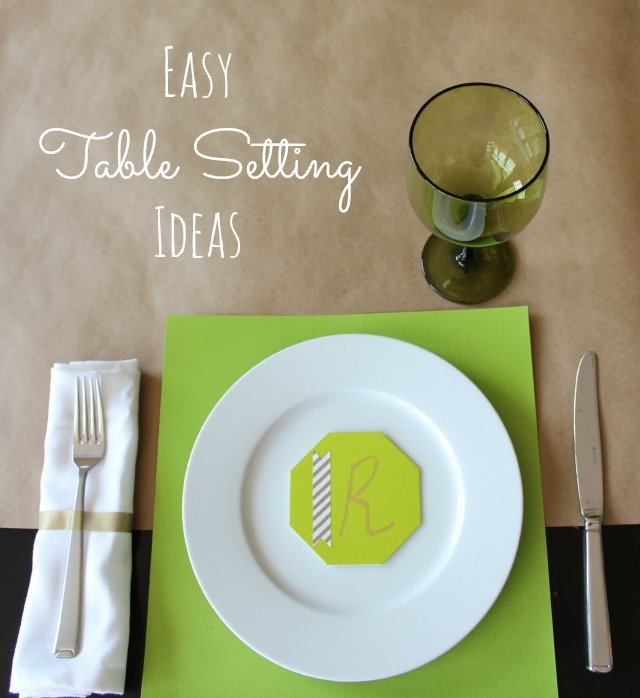 These simple placemats are actually sheets I tore from a book of 12″x12″ cardstock paper. I chose 4 different shades of green. 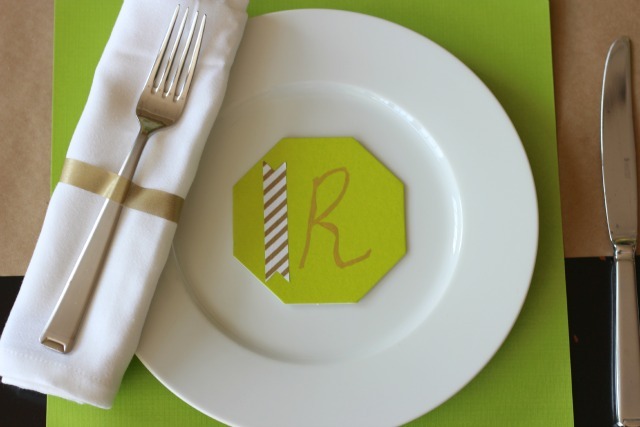 The cardstock makes for a sturdy placemat and you can throw it away afterwards. I wrapped a piece of gold washi tape around the napkin to hold the fork in place. No need for napkin rings! 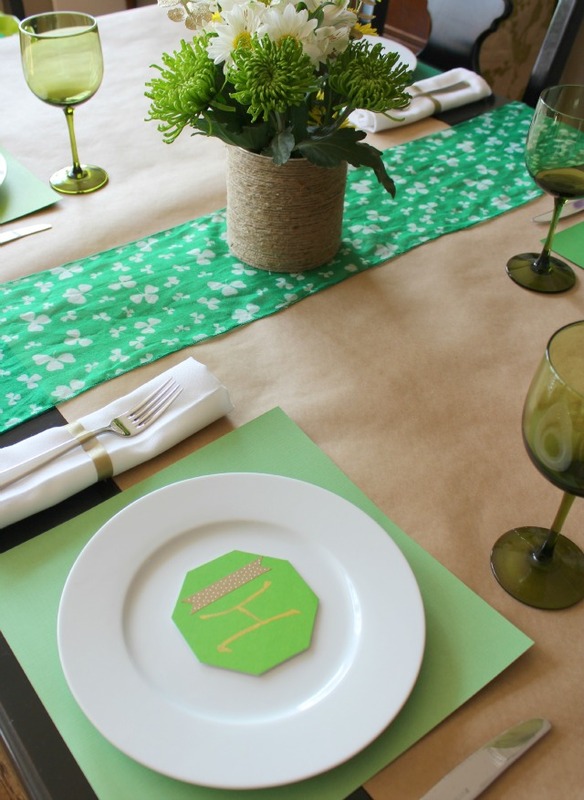 For the place cards, I used one of the green coasters left over from my shamrock garland. I added a piece of washi tape and wrote each person’s initial in gold metallic pen. You don’t need to spend a lot of money on flowers for the table. This $10 arrangement from the supermarket did the trick when put in a decorative vase. The key is cutting down the stems enough so the flowers just pop out of the top of the vase. 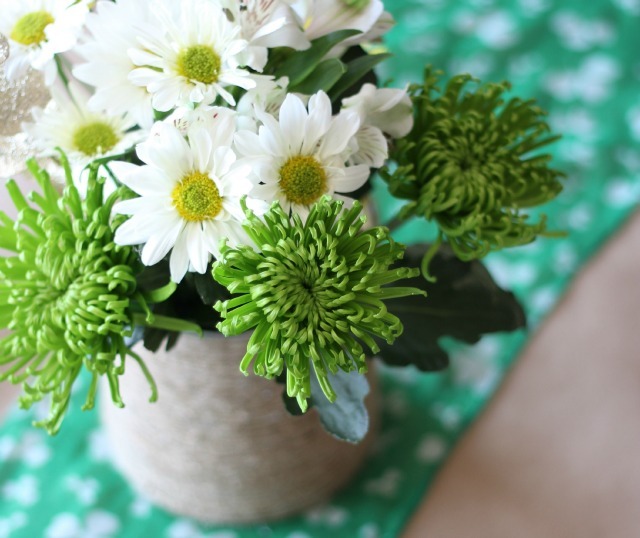 Check out some more tips for arranging supermarket bouquets. Once again, I rolled some brown kraft paper down the center of the table to use as a runner. This is my go to for table runners. To me they are a much easier alternative to a tablecloth. My tablecloths are always full of wrinkles, and the last thing I want to do is take the time to iron them! 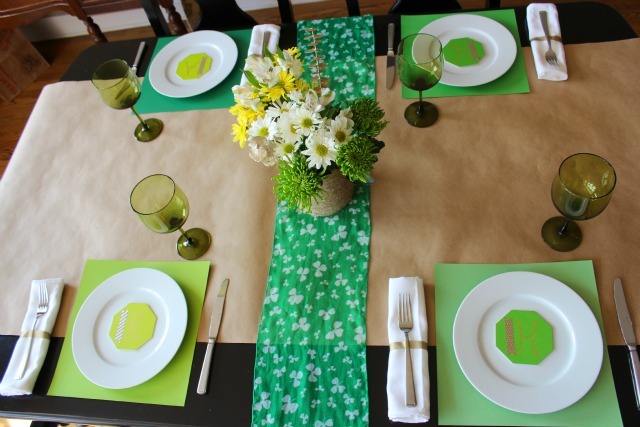 For the St. Patrick’s Day table, I ran a small scarf down the middle of the table perpendicular to the runner. Scarves make for a great runner, so raid your closet for some creative options. 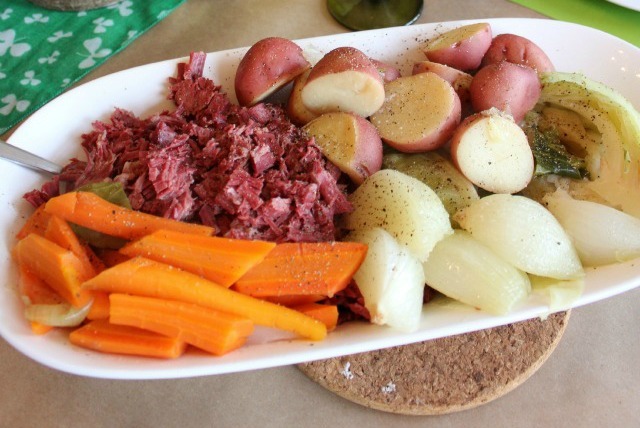 The tablescape was nothing compared to this amazing corned beef and cabbage Ross made. It was sooooo good!